As you know, safety of our customers was, is, and will always be our priority. We are recognized by our honest approach towards our customers, providing them with all relevant, available information needed to make good, informed decision regarding our offered products. Therefore, we think that it is necessary to discuss a few things about the Wingtip pouch (WTP). 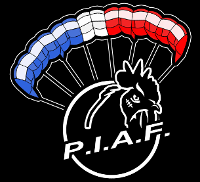 Until now, PF installed WTP to several wingsuits, and all installations have been made during the production process of the WS. That was the only way that we could be sure that the WTP installation was done properly and in a clean and precise manner, which was additionally verified by the inventor himself. So, having some previous experience with the WTP, we would like to express our opinion regarding it. It is marketed as “parachute opening design which is absolutely safe, easy and logical“. We would like to discuss a few things regarding that statement, things we believe are important for anyone considering the installation of the WTP on their wingsuit. a) Introducing the added step in the parachute deployment process. In our opinion the WTP is a step backwards in comparison to the throw out system. WTP is comparable to the ripcord activation system. With the ripcord, you pull the handle and open the container, but from that point on, you have no control on the opening sequence. You just hope that spring loaded pilot chute will jump out, catch air and pull the bag out of the container. With the WTP, you pull the handle and hope that pilot chute will be extracted. The throw out system is simple and reliable, proven for the last 40+ years. In particular, it is because the throw out system excludes that one step between activation and the opening sequence. You grab the PC, throw it in the airstream and the opening process starts immediately. b) The installed WTP system has number of components. Placement of WTP components on the WS is dictated by the type and size of the WS in combination with the type and size of the harness/container. By changing the container, you risk that the WTP installation on the WS will not fit properly as before. Also, such a system may not work as expected if the fit of the WS is not perfect (e.g. arm wing is too long or too short for the flyer’s arms and the suit simply does not fit properly). For example, in case of an ill fitted arm wing(too big in length), the pull of the WTP handle may not be sufficient to actually release the pilot chute. c) Relatively complex installation of the WTP over the arm wing also means that the system is more prone to rigging errors or hang ups, be it because of a snag on the airplane door, lag of bridle slack between the pin and wing/bridle channel, or too exposed bridle slack. The list could go on. 2. Exits – WTP pull handle is located on the WS gripper, and is integral part of the gripper itself (sort of a gripper clip-on). During the jump, the WS flyer is actually holding the WTP pull handle, and not the gripper. It happened more than once, that a flyer lost a gripper on exit (often due to bad footing and consequently induced tension on the WS wing). With the WTP this can end up as serious emergency if this, when reaching back for the gripper, results in an activation. 3. Pull technique – common pull technique on modern high performance WS is to (relatively aggressively) flare the WS prior to deployment. Near the apex of trajectory, the WS attitude is pitched upwards, at an angle approximately 45-60° relative to horizontal. Both, vertical and horizontal speeds, are drastically reduced and in that point the pull sequence is initiated. In that situation the lateral stability of the WS is often not so good (especially with less experienced) and the flyer can slide to one side, allowing the PC to slide over the body to the other side. 4. Also, WTP is not designed to ensure cleaner and faster deployments. Just “easier”. Pilot chute hesitation can happen regardless of the deployment system used. This has happened before and will be happening in the future. 5. Pilot chute sizing – wingsuits are designed and made in a way that the area where the PC should be located is more or less the same size (regardless if the WS is made for 170 cm or 200 cm tall person). The size of the PC on the other hand varies according to the type and size of the canopy, and the type and size of the WS. Additionally, even pilot chutes from different manufactures are very different pack volume wise, because of their design and materials used. 6. Limited installation options - WTP can only be installed on a WS with wingtip grippers. For wingsuits without grippers and tracking suits, the bottom of container (BOC) pilot chute deployment, remains the only option. Changing deployment methods can oppose a certain degree of a risk by itself. 7. WS asymmetry – modern high performance WS are very sensitive at high speeds. Having a bulky and heavy part on the wingtip, can lead to asymmetry and induce lateral oscillation. All that said, it is necessary to emphasize one more time that believing that a jumper would be safer simply by using the WTP is not true in our opinion. Only FAIR AND OBJECTIVE JUDGMENT OF HIS OWN SKILL LEVEL and appropriate/smart selection of exits, lines and pulling height can make a jumper safe. We at Phoenix-fly still think that simple throw out pilot chute located at bottom of container (BOC) is safer and more practical than the WTP. Therefore we would like anyone interested in installing the WTP on their WS to think about this disclaimer before making an order. Phoenix-fly is ready to install the WTP on request. Installation will be done during the WS production process, strictly in compliance with the WTP inventors. WTP installations made by PF will be done using Atair’s low bulk 36 inch PC. Please note that WTP can be installed only on newly ordered wingsuits during the production process. We are not offering a WTP retrofit on your already made wingsuit.